Time to get out your trusty secateurs (favourite word ever!) and prune your roses. Remember be ruthless but careful. Winter pruning is the most important part of caring for your roses and will help keep your roses healthy and ensure lots of beautiful blooms. There is lots of information about pruning but in this blog we will try and keep it simple and give a few links to the most straightforward and practical information. Remember to clean your secateurs ( I use methylated spirits because it cleans and disinfects the blades) and wear heavy duty gardening gloves. 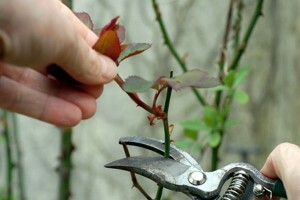 Once you begin pruning step back and view your rose from a distance so you can see the shape that is emerging. To make sure you are pruning it in the right way keep referring back to the pictures in the first link to give you an idea of what it should look like.